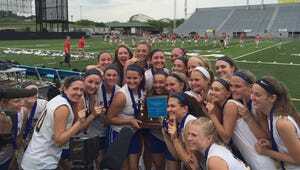 The Kennard-Dale girls won the first district lacrosse championship for any YAIAA team. HERSHEY - For the first time in the young history of District 3 lacrosse, the championship is coming to York County. After watching Manheim Township win the tournament the last seven years, Kennard-Dale completed an impressive district postseason run Thursday with a 12-8 win against Exeter Township in the championship game at Hersheypark Stadium. A sophomore trio of Morgan Bowings (five goals), Maddie Day (three goals) and Clare Boone (12 saves) helped the Rams bring home the gold medals for the first time. "It was so overwhelming," Boone said of being able to finally hoist the trophy. "We were just talking about how the last district championship Kennard-Dale won was in 2001 so this is obviously huge for our school and huge for our team." The Rams had been to the championship once before and reached the semifinals four times but never won gold. Several players shed tears Thursday while head coach Kelly Wetzel awarded each girl a gold medal. A strong showing of Kennard-Dale faithful cheered and chanted throughout the afternoon, but never louder than when the trophy was lifted. "We love it, we're so glad they're here," Bowings said of the Rams fans. "I'm so glad we have a school that cheers us on, it's great." Thursday's game stood in contrast to Tuesday's closely contested semifinal against Manheim Township, when the Rams had to battle back to pull off the win. In the title game, Kennard-Dale led by eight early in the second half against the Eagles and seemed to be on the verge of cruising to the finish. But a late Exeter run closed the gap to four with less than five minutes left. The always-steady Boone made three crucial saves in the final minutes to hold off the Exeter rally. "The lead helped with my confidence," Boone said. "And we just wanted it so bad. We came this far, we couldn't lose it at the end."